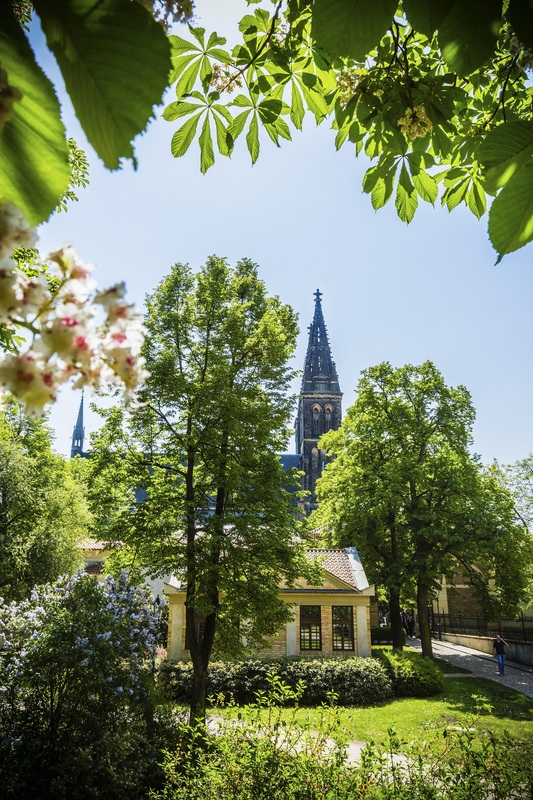 An oasis of tranquillity and beautiful walks offers not only romantic nooks and vistas of the Vltava River and Prague Castle and a look back at recent history and profound, reverent remembrance of Czech greats, but also offers a children's playground and several cafés and a restaurant. The park is decorated with several statues such as the equestrian statue of St. Wenceslas, which originally adorned the fountain on Wenceslas Square. From the distant past come the Devil's columns - three pieces of a stone timekeeping column from Slavic pagan times. 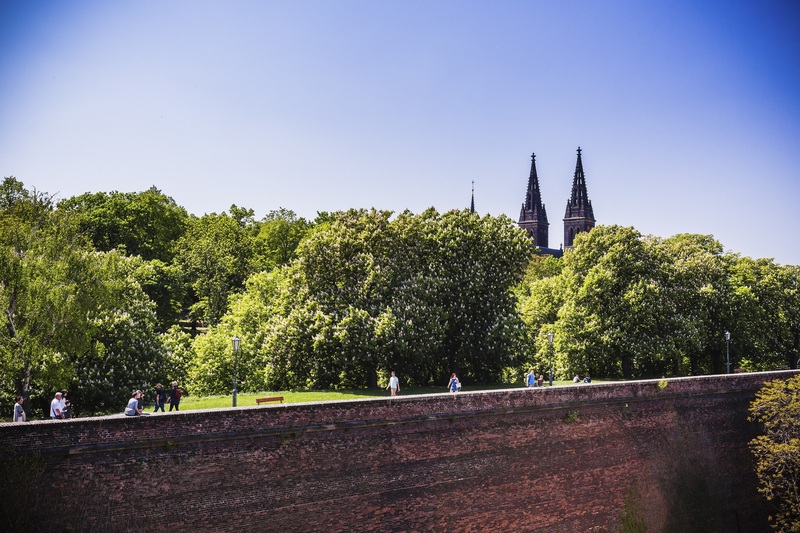 In the ancient times, there were no trees at Vyšehrad, only on the outside the area was encircled by woods. After the Hussite Wars, vineyards, gardens and fields were established here. The 18th century and the first half of the 19th century brought no green to Vyšehrad. 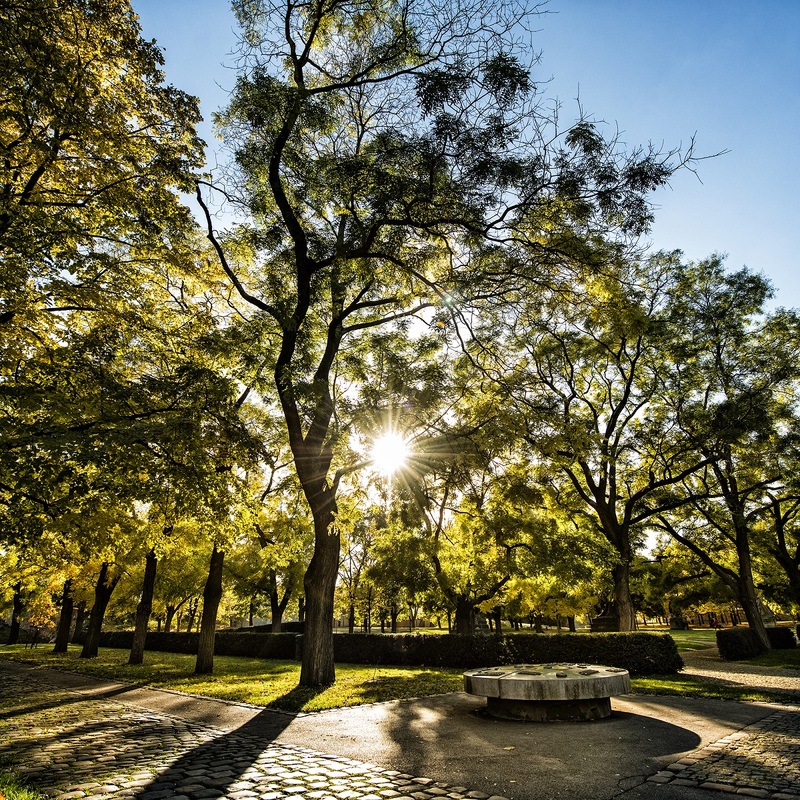 The first reference to some planted trees only dates back to 1841, when an alley of locust trees was planted by the path to Tábor, which today connects all the Vyšehrad gates. The green vegetation of the time-honoured Vyšehrad was mostly established during the 19th century, and largely consists of two originally private parks - Karlach Gardens and Štulc Gardens, two private gardens - the New Provost’s Garden and the New Deanery Garden, and then the Park under the Ramparts (Pod hradbami) and the Vyšehrad cemetery. When the tomb of important Czech personalities at Slavín was completed on the Vyšehrad cemetery in 1893, there was a need for dignified arrangement of the surrounding area. It was realized under the management of Karel Skalák, then the director of Prague gardens and parks. In the years 1927 - 1928, the original place of the princely and royal castle was arranged into a garden. A central grassy parterre was established, and it was decorated with three sculptural groups by Josef Václav Myslbek in 1948: Lumír and a Song, Záboj and Slavoj, Ctirad and Šárka. The first sculptural group had originally been placed at the Nové Město side, the remaining two came from the Smíchov side, where they had been installed by a pillar of the Palacký Bridge. The fourth sculptural group depicting Přemysl and Libuše, which came from the Nové Město side, was badly damaged by an air-raid on the 14th February 1945, and it was being repaired for a very long time afterwards, to be added to the others only in 1977. 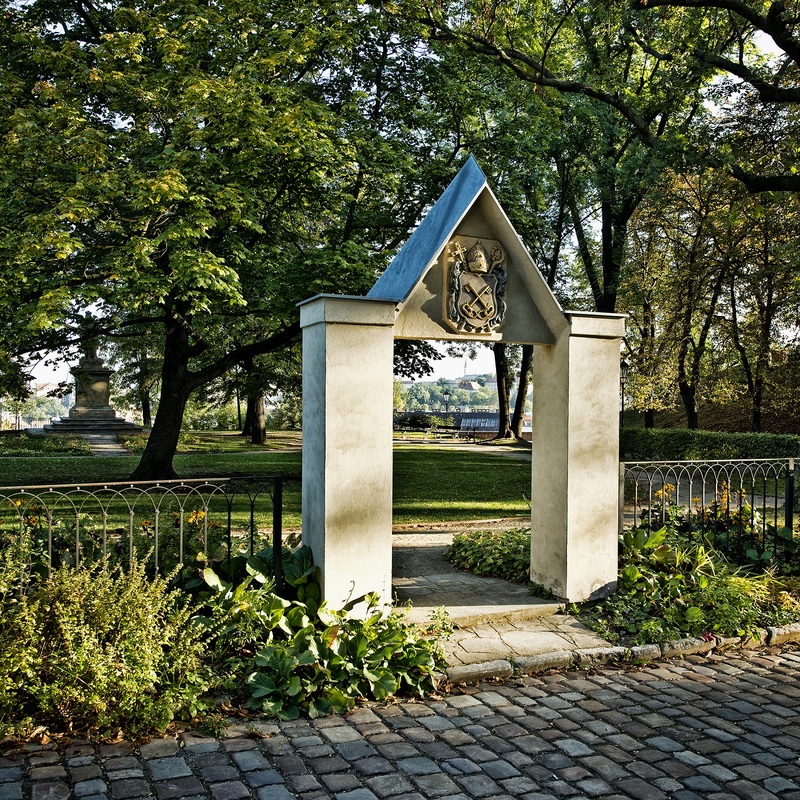 Between the streets K Rotundě and V pevnosti, opposite the New Deanery, there is the most extensive Vyšehrad park named Karlach Gardens, spreading over more than 1 hectare. The elevation above sea level is 230 m. The gardens were named after the contemporary provost of the Vyšehrad Chapter, Mikuláš Karlach, who gave the initial impulse to establish the gardens. At first, the park was fenced and private; it was nationalized in 1948. 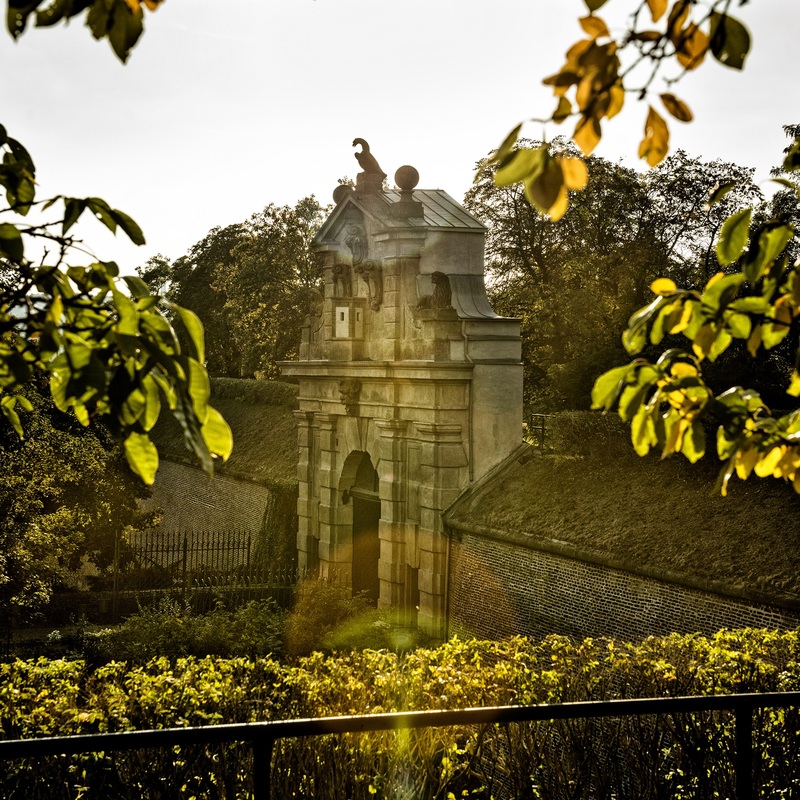 An extensive modification began in 1954, when the fences were taken away, the lawns and the paths were restored. The park was extended and made accessible for public. In 1999, the reconstruction of the gardens started according to a project of architect Otakar Kuča. Approximately in the middle of the garden, there is a statue of St. John of Nepomuk (from 1895). In place of the former watch house, there is the so called Devil’s Pillar: three pieces of a stone, probably a timekeeping pillar of old Slavonics from the pagan times; they are leaning against one another. Their overall weight is two and a half tons, and together they are nearly 6 m long. The material, granodiorite, cannot be found anywhere near. When lightened by sun, it gives out a slight smell of sulphate, and that was probably the base for the following myth: the capitulary from Vyšehrad did not have money to pay for his debts from playing cards, and so he made a bet for money with a devil named Zardan, claiming he would serve a mass before the devil can bring a pillar from Rome, from the Temple of St. Peter and Paul, to Vyšehrad. The devil wanted to win by cheating, and so he took a pillar from a temple not so far away, for which St. Peter punished him by knocking him down to a sea. Therefore the devil only arrived at Vyšehrad after the mass, and enraged he threw the pillar on the church’s roof so hard, that it fell through and split into three parts. They actually used to be placed inside the church, until Joseph II ordered to take them outside. Another legend says that the pillar was shot from a canon in 1420, when Vyšehrad laid siege to the Hussites, by a marshal named Čert (Devil). That was, however, far from being possible due to the contemporary technical possibilities. There is a park of approximately one quarter of a hectare by the Štulcova Street in front of the New Provost’s Residence. It was established in 1873 - 74 by a Vyšehrad Chapter Provos Václav Štulc in relation to the construction of the new provost’s residence. The private park used to be fenced. Today’s appearance is from 1954, when it was modified according to a project of architect Jiří Novotný in relation to the opening for public. The park can be accessed via a preserved new-Gothic gate with the emblem of the chapter (two crossed keys). Nearby, there is a bronze bust of provost Štulc by Štěpán Zálešák, and in the centre, there is an equestrian monument of St. Václav by Jan Jiří Bendl from 1678. It was originally located at the Wenceslas Square, in the middle of a fountain, and it was moved here in 1879. In 1965 it was replaced by a copy, and the original was deposited in the National Museum’s Lapidary. 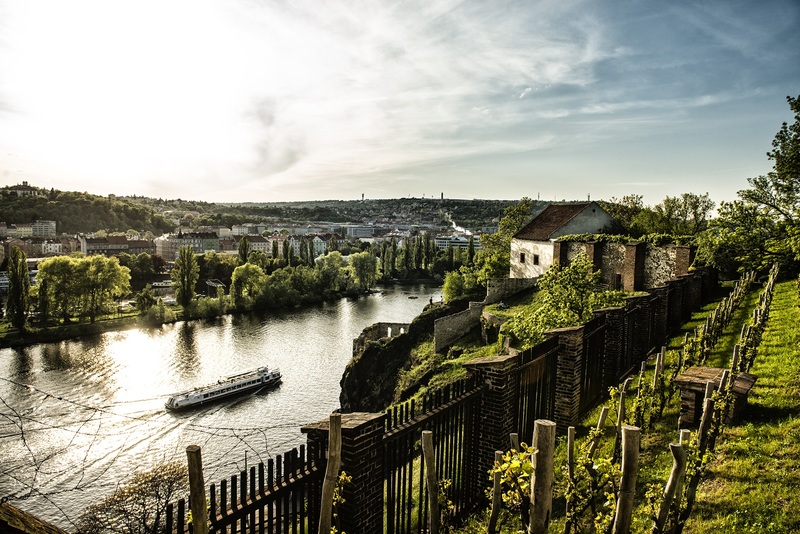 It is situated in the slope above the Vltava River with a beautiful view of Petřín, Malá Strana and Hradčany. The first trees were planted on this hillside in the 1890s as an initiative of provost Karlach. From 1892 on, the hillside was arranged according to a project of František Thomayer by the city, which purchased it from the Vyšehrad Chapter. During the 90s, a gradual rehabilitation started in a romanticizing style. These are private territories of the Royal Collegiate Chapter, which serve the purpose of utility, meditation and relaxing gardens.